Patriots win battle against Wildcats 25-18, 25-16, 18-25, 25-19. 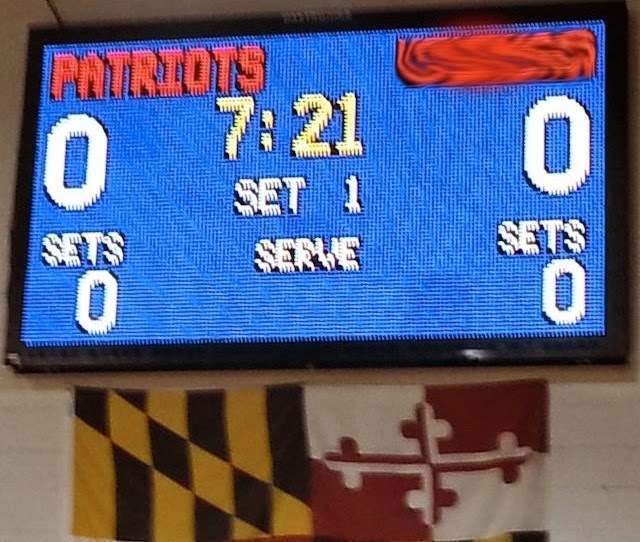 There are spaces to show points and sets earned by Wootton and the opposing team. At 7 minutes and 21 seconds until the match begins, neither team has scored a point. The teams must actually play the match to earn points, and win sets. When the teams do earn points, only whole numbers can be recorded where the scoreboard shows a "0." A team earns a whole point after a rally... or doesn't. Same with winning a set. There are no half points awarded. Hmmm... awarding partial points is an interesting thought.... Maybe 3/8 points awarded for "style." How about 5/12 points for "effort." For some things in life, points are awarded to people who just "show up." That's worth a half a point, eh? No no no no no. Not in volleyball. The team that wins the volley get the entire point. The team that loses the rally gets no points. The scoring system works well as is. Otherwise, uniform choices could be a deciding factor in a close match. Wootton and Walter Johnson had similar uniforms. And records. Aside from the fact that Wootton was playing against a school named for a great baseball player at the same time the Washington Nationals had their home baseball opener (points for baseball-volleyball "metaphors"? ), both teams came out swinging for de fence (get it? defense. ). This one was a close match. Both teams showed up to play and battle for every whole point in each of the four sets. Both teams started the match with zero points, and with no style points to burn. The Patriots earned enough points in this match to get the win. For the Patriots that were on the court at times, and for the Patriots that were on the bench during the match, this counts as one win for the whole team. THEIR team. There is no other way to score against talented and well-coached Walter Johnson team except to earn every point. The second half of the season will present the same challenge to the Patriots. The Patriots play at home against Churchill on Monday, April 7, 2014. The boys play following the 5:15 pm coed match.